Cooler Behind A Cold Front Today. Mobile App Link For My Daily Blogs. Blog updated at 3:10 PM MST. Quote- "On this day in 1996, a wind event for the history books occurred with a peak wind gust of 128 mph at Guadalupe Pass. The sustained wind was hurricane force from about 1000 am until about 300 pm with a maximum sustained wind of 105 mph. Although the Pass is famous for wind events elderly ranchers in the area said they had never seen the wind blow so hard. The highest winds and most damage occurred in the mountainous zones, however strong to damaging winds occurred over most of the warning area. One fatality resulted as a 56 year old South Carolina man was killed when he drove his car into a parked trailer truck which had just been involved in an accident. The Department of Public Safety report stated that visibilities were ranging between 20 feet and 1/4 mile with a visibility of 50 feet being common during the clean up of the accident." Peak Wind Gusts Reported Yesterday. Today Into The Weekend Across SE NM. 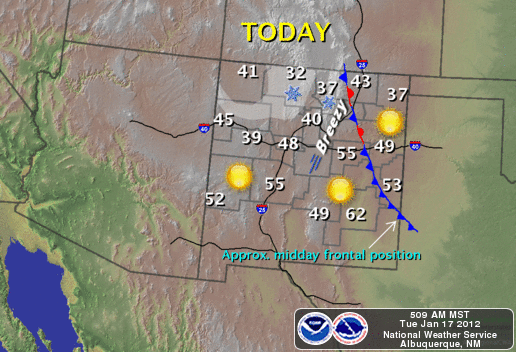 A cold front will move into the area this morning. 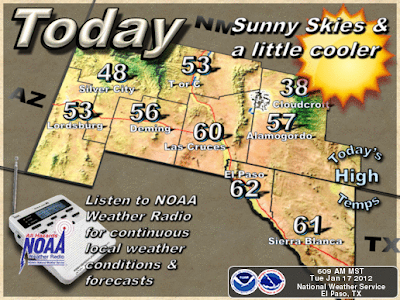 Under sunny skies, current NWS forecasts have our afternoon high temps ranging from 54 in Tatum, 58 in Hobbs, 61 in Roswell, 66 in Artesia, to 68 in Carlsbad. 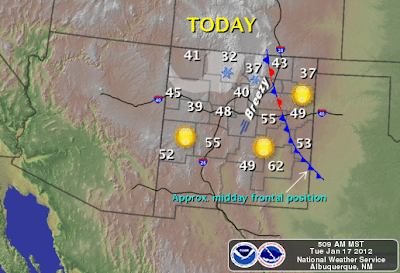 If the front is a little faster in arriving than current thinking, then we may not be quite this warm. A quick warm-up will commence starting tomorrow which will last into the weekend. Forecast high temperatures tomorrow range from the upper 60's to near 70. 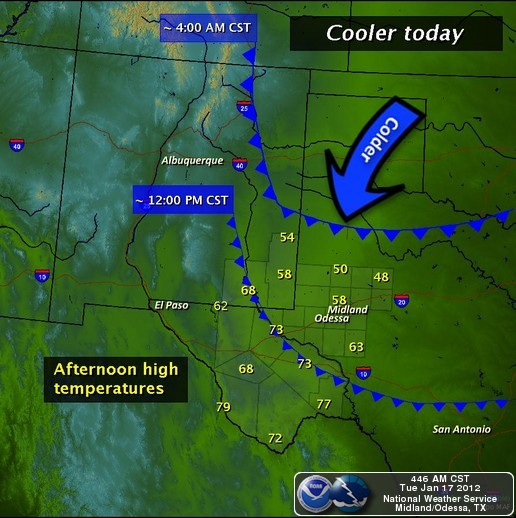 Highs on Thursday range from the low 70's to the upper 70's. By Friday most of us will see the mid-upper 70's, with a few spots flirting with the 80-degree mark. Windy weather may return to the area Friday as a fast moving disturbance zips by to our north across southern Colorado. Warm weather will prevail into the weekend as well, with our high temperatures expected to be in the 70's to near 80. 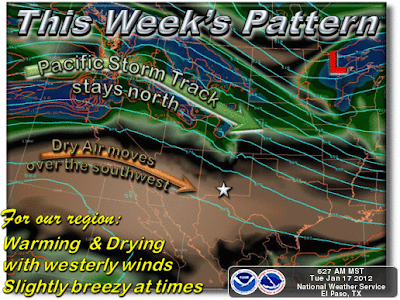 A Pattern Change Next Week. Yet Another Major Winter Storm For NM? 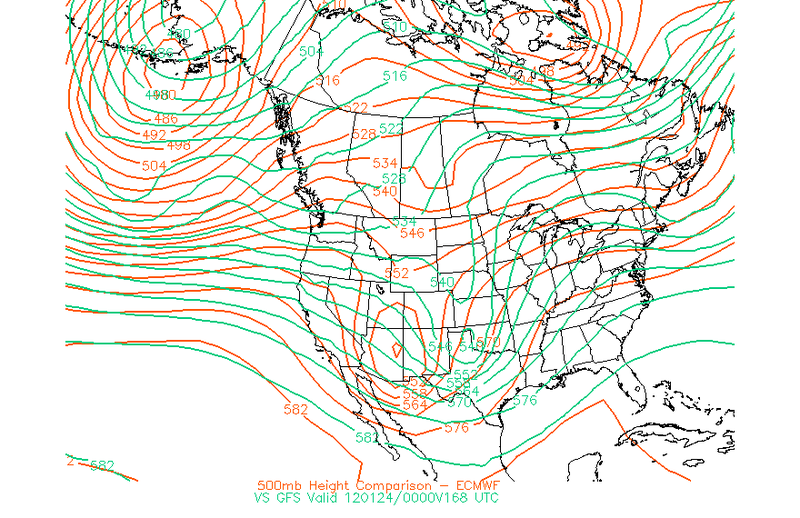 ECMWF 00Z/5 PM MST Forecast. Valid At 5 MST Mon Jan 23, 2012. Last nights 00Z/5 PM MST run of the European computer forecast model, continues to forecast yet another strong closed mid-upper level low over the Desert Southwest by the first of next week. By sunset Monday, it is forecasting this next potential Major Winter Storm to be located over southeastern Arizona. This ought to sound familiar, the two previous storms that took this track each hammered southeastern New Mexico with a foot of snow. The first one was the Christmas Eve storm that dumped 12" -14" of snow on Carlsbad, and 9" - 11" over most of the rest of the local area. The last storm was the January 9th Winter Storm that dumped 12" - 15" of snow on the Hobbs and Nadine areas. 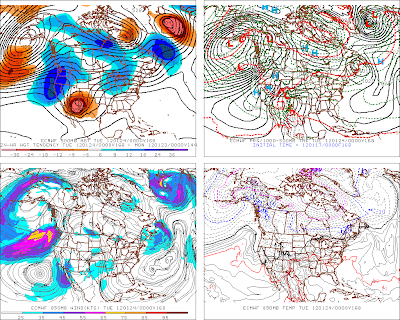 GFS & ECMWF 500 MB Forecast Comparisons. 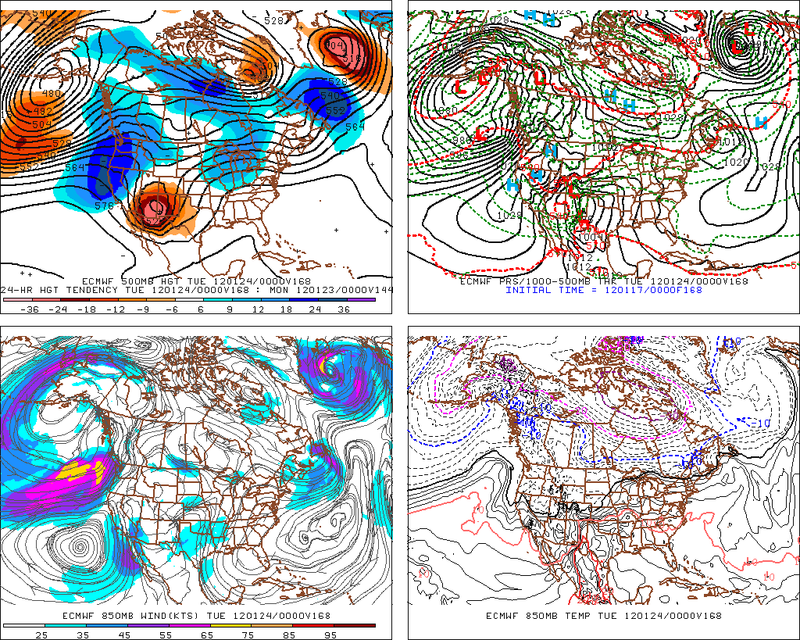 Valid At 5 PM MST Mon Jan 23, 2012. As has been pretty much the case all winter long, the GFS and ECMWF models have different forecast solutions for this next potential Winter Storm to impact the area by the first of next week. 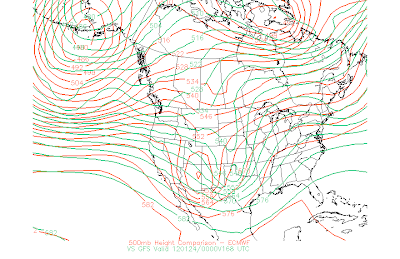 The ECMWF slows the storm down, and forms a strong closed mid-upper level low over Arizona. Meanwhile, the GFS model keeps the storm as an open trough of low pressure sweeping across the Texas Panhandle by Monday. So we will have to wait a few more days until the models settle down and see which scenario wins out. We may either have yet another Winter Storm to deal with by the first of next week, or a windstorm here in SE NM.